Combine all salsa ingredients in a food processor. Pulse on/off until the mixture is chopped (not pureed). Place in a small sauce pan and stirring constantly bring to a boil, cover and chill at least 1 hour. In a skillet, combine ground chicken, onion, thyme and salt. Stir cook until the ground chicken is no longer pink and any liquid has evaporated. Remove from the heat. Beat together egg and sour cream. Stir into the meat mixture. Fill tart shells. Bake for 12-15 minutes until crust is golden brown. 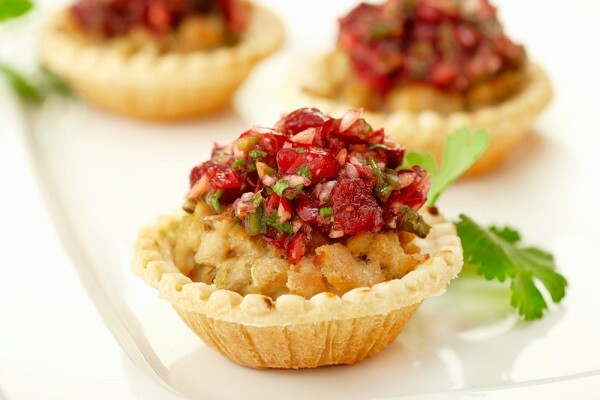 Serve warm tartlets topped with cranberry salsa. Salsa will keep in the fridge for one week.